The historical origin of flag-throwing is to be found in the exercises to which the standard bearers of old armies submitted themselves with their banner and to maintain the body in perfect physical fitness conditions as well. The flag-throwing was carried out during particular celebrations and then, the joyful polychrome twirl of drapes gave a more spectacular tone to them. 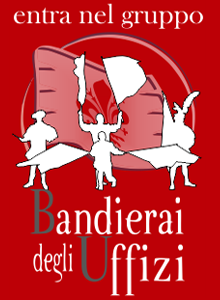 All the evolutions that currently the Bandierai degli Uffizi with their insignia perform, are not the result of personal imagination or due to the currently improvisation, but the result of a precise and demanding training carried out in the absolute respect of old basic figurations of the tradition. The Standard bearer has a free and flexible movement, acquired by the constant athletic preparation, through which performs the most various evolutions and the most challenging throws with style and elegance. The “Velata”(Veil), the “Molinello” (Whirpool), the “Salto del Fiocco”( Jump of Flake), the “Scambio diritto ed incrociato” (Straight and cross swap) the “Rovescio”(Backhand), the “Passaggio sottogamba ed intorno al collo ed alla vita”(Step under leg and around the neck and the waist), the “Onda” (Wave) are the typical traditional basic figurations which recur always in the exercises of the Bandierai. Initially, each pennant showed the insignia of one of the 16 main Magistrature existing in the Florentine Republic of 16th century. Since 2002 we have moved to what is the actual aspect of the banners, classified.